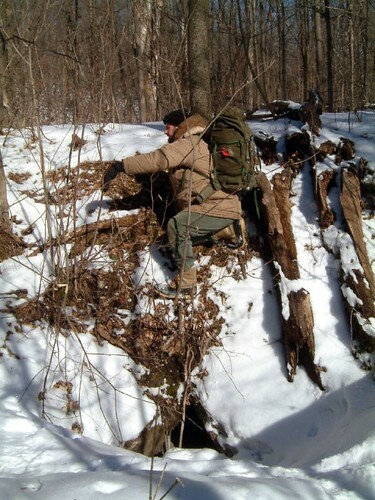 Got to watch for polar bears and sasquatch – I heard a caver just got eaten. Here I am in one of my favorite Ontario caving spots looking for more tunnels. Winter is often a good time to look for caves as you can see the breathing holes and with few leaves and brambles – holes can be more visible. This particular spot is at the edge of a resurging valley somewhere near the Crowe River. I am climbing up a slippery embankment that is one of several ridges that soon progress to an escarpment that I am absolutely sure is underlain by caves. In this area there are 3 distinctive joint directions and I can see a length of straight-line collapse beneath the soil in one spot on the nearby escarpment. There are undoubtably tunnels under there – its just gonna take some digging. 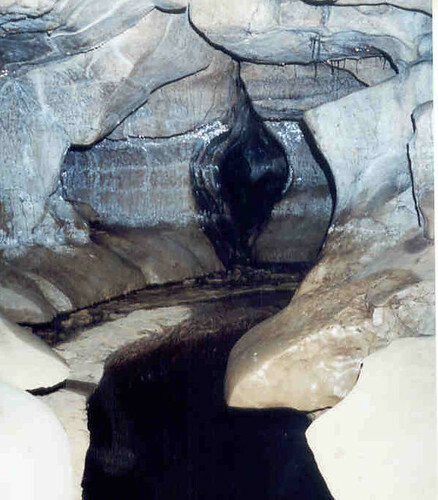 Sometimes its esy to get depressed about Ontario’s caving possibilities, but the caves are there, they just need digging and as cavers we just need to get together and do some serious work. We lack unity thats our problem! old pics 168, originally uploaded by Mic2006. I decided that it would not be delivering on my promise if I held off on Dewdneys so here is my story. The triangular shaft that you can see in the last post is actually called “Ongley’s Hole” – named I suspect by Ongley who had made the first map of the cave that is more commonly known as Dewdneys Cave. When I first visited Dewdneys around 18 years ago there was an old hemp rope hanging down this shaft – it goes down around 10 or 15 feet to the cave’s main tunnel. Wearing my backpack that was packed with camera equipment I began the descent. The rope was really thick but it broke and I fell to the bottom of the shaft and landed on my back on top of all of the equipment. It was a costly outing. An important lesson there that should be illustrative of bold-faced stupidity, but lets be honest – who has never done something stupid? You will notice by the last post that someone has placed a ladder there. 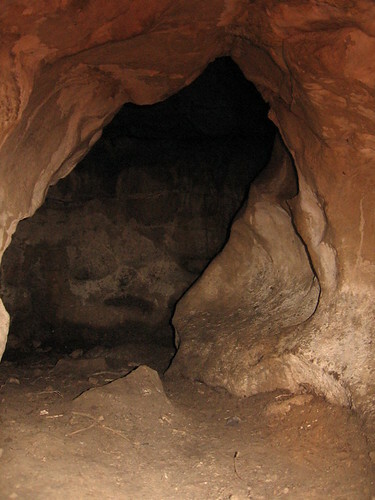 The triangular shaft is the way in which most people enter the cave but there are several other karst windows. The picture with this post is up the other end of the horshoe that makes up the main passage. Some have asked whether the wall in the background is natural – it is. A point in note is that just a litle further up this passage there is another triangular shaft up to the surface, but it is too small to fit up. I suspect the shape is representative of the dominant joint trends in the area. Notice the channel that has been incised in the floor by vadose action. 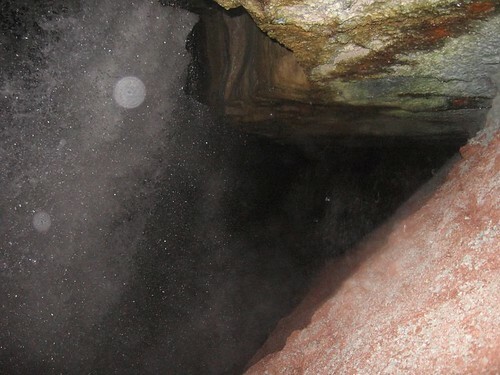 Observe the tunnel in the background that was predominantly formed by pheratic solution.